Please click on thumbnail for complete information. 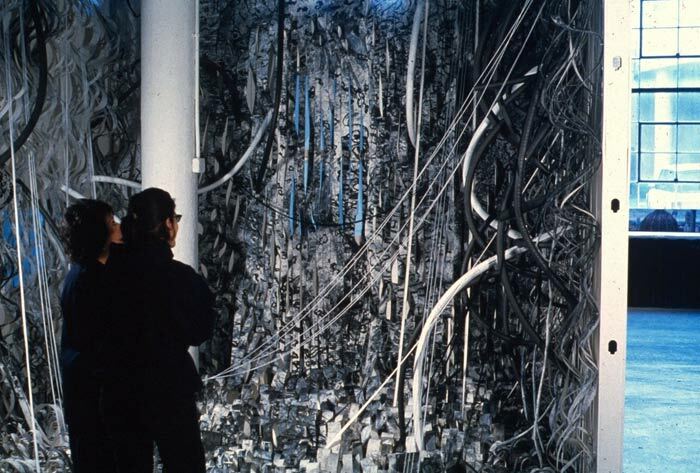 Artist Statement: This installation provides the opportunity and ability to walk completely around it, acting as a counterpoint to an immersive experience. We are ‘in’ the work as we encircle it. We surround and encompass it; the relationship and experience of being in the work and surrounding it are simultaneous. Similar to Japanese tea ceremony, host and guest exchange roles but are equal. Prior to this exhibition, I did extensive research of people’s traffic flow within enclosed spaces, for example, shopping malls and supermarkets. My research indicated that a clockwise movement was the most used in building plans. I also understood from basic art history that a clock-wise circular movement was traditional in Renaissance painting. We ‘enter’ a painting in the lower left hand corner, travel up to the upper left, proceed to upper right, onto the lower right and back to lower left, where we began. Similarly, the act of circumambulation has also been part of my extensive studies of Buddhist temples and sites. (The movement may be counterclockwise, however, depending on different Tibetan Buddhist sects. I also became interested in the literal accessibility of artworks, particularly in the height of paintings in museums and galleries. My experience was that, on the whole, paintings are shown too high for person in a wheel chair. The title itself directly points to 9/11/2001, particularly the sense of being unprepared, the act of surprise and the unexpected of what we saw. The initial encounter with “An Undisclosed Location” appears somewhat normal, except that we have come into an area looking at the back of a building. 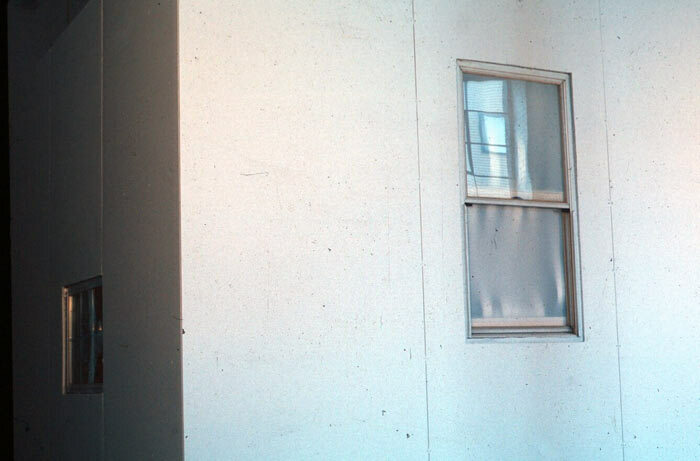 Within the building’s wall, is a standard size window, placed at typical height and location. 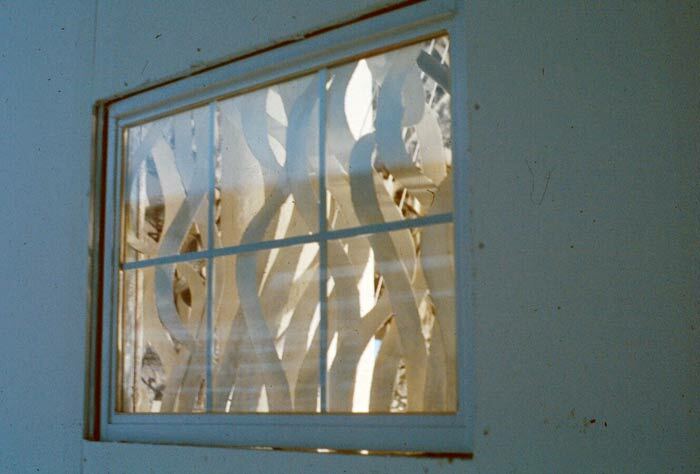 Nothing is unusual in the structure, except what appears to be within the window itself: some undefined movement, or objects within the room, that are causing movement. The image within the window is unclear, cloudy and obscured. 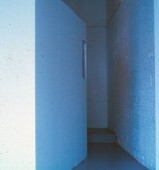 Visitors to the exhibition turned and walked to the left side of the built room. Another window, lower level this time, forced viewers to crouch and peer in to the window. Those in wheelchairs however had a direct view without strain. Within the window, there are similar appearances of movement, with more defined shapes, because of a strong light within the room. However, the exact information of the interior and what it contained is still obfuscated. 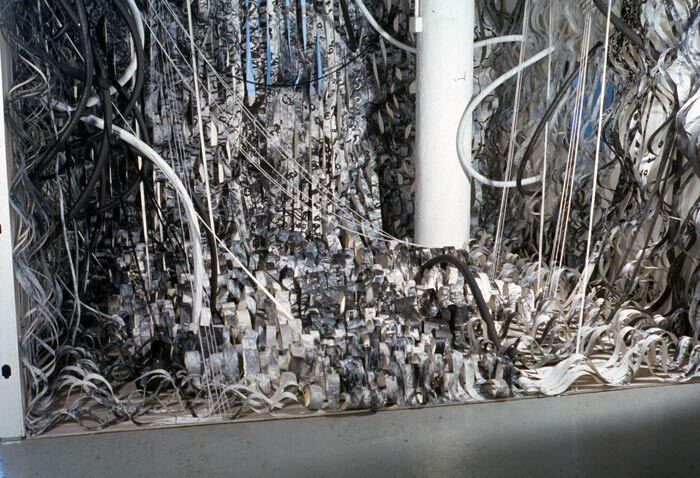 The next turn, to the right, reveals the entire room: cascading ribbons of drawings, cut into strips, saturated the room. 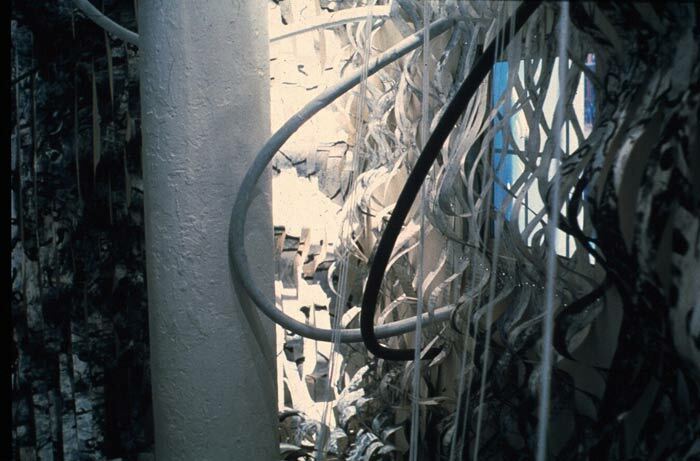 Ribbons of rubber and string also collided within the room. The immediate sensation was shock, surprise and an overwhelming sense of claustrophobia. 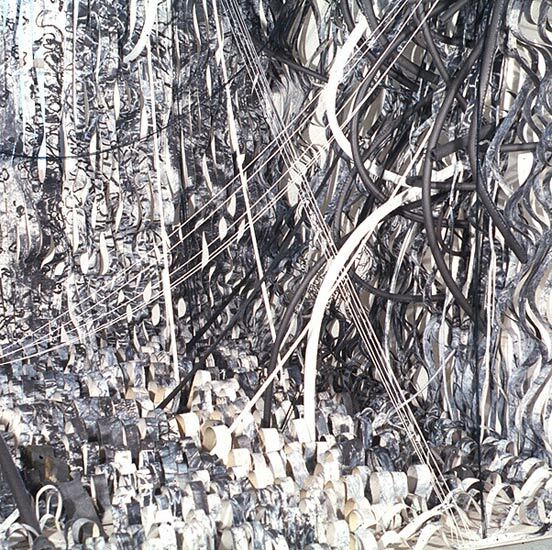 The strips are made of 36 drawings, using black and white charcoal, graphite and paint sticks. 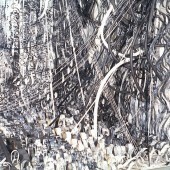 Each drawing is18 feet by 40 inches then cut into 3-inch strips. The younger monk replies, scoffing at the elder, “The wind is making the flag move”. 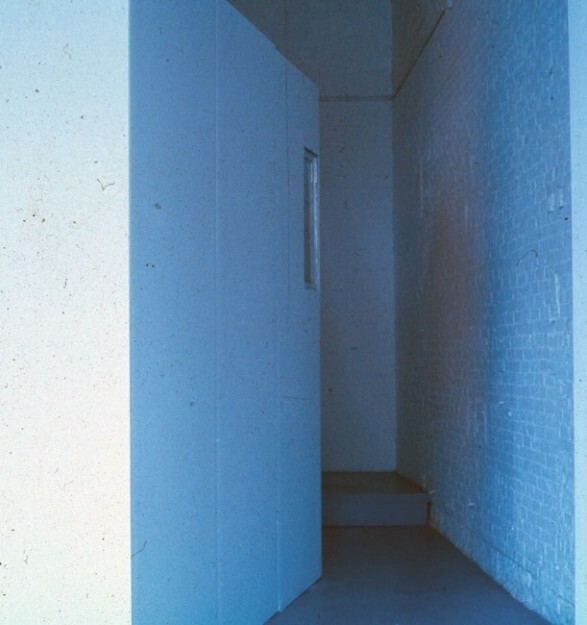 As viewers/participant turn again to the right, the scene is left behind; the adjacent wall has one window, this time out of reach and height to everyone. With the final turn to the right, the work has been circumambulated, the movement in the window remains and the monk asks his question again.